It’s days before the start of Subcase 2019, and if this was Tinder, I would have realised how logical and practical it would be to swipe right, but I probably would have swiped left…. The act of selling myself and my work, networking (sober mostly). It’s enough to make my toes curl. But for those of us without the luxury of a producer to do it, this has to be done…sell sell sell. I attended Subcase for the 3rd time this year. For the first time since moving my company and artistic work to Sweden, I applied to have a table in the exhibition space, was accepted and received the invoice for the opportunity. Simultaneously, CircusTalk asked if I would write an article for them on Subcase. This inspired a fun run of double identity problems and resulted in two lanyards, which I was very pleased with, not wanting to confuse myself more than necessary with which work I was doing. Not so long ago this article could have started with a self-pitying thought about how as artists we are not taught to sell ourselves. But in this day of Instagram, social media, blogging, vlogging, likes and followers that might be a pushing my luck. Even so, there is a difference between collecting a following on social media and self-promotion, and understanding how to sell one’s artistic work, or organise a tour, for actual money that one can pay rent and buy food with. Not to mention that at least here in Scandinavia, we are very lucky to have a strong move for supporting circus artists in this (via Manegen, Kulturrådet, Subtopia, Konstnärsnamnden, to name a few…) There is quite a wealth of support for us (especially if I compare it to the other European countries I’ve lived and worked in, like the UK and Germany). The university course in circus at DOCH also continues to streamline the learning and education of circus into a package which normalises the notion of buying and selling a work (or artist) by having courses in management and production, alongside the usual acrobatics, artistic research, creative courses and discipline training. This enables the other worlds (of business, academia, art) to better understand and market us/them. So, Subcase, thanks for the cool array of panel discussions! 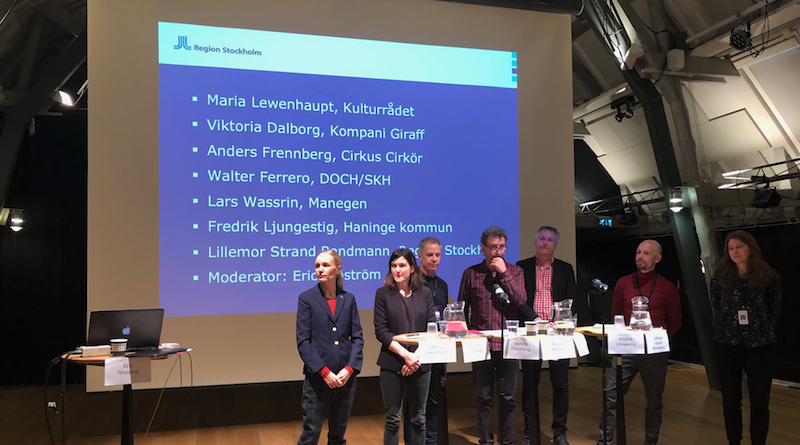 I chose to attend ‘Men Too’ a panel discussion designed for men only, organised by Love Kjellsson to discusswhat next;post ‘me too’ and towards an equal society. After requesting permission to attend this men only event, the organiser smiled generously and said ‘Of course, no problem’, and that in fact it was mainly women who had signed up anyway. Three men and 10 women attended. Judging by the gender spread of those attending Subcase I can only wonder… where were the many other male Subcasers? The discussion was detailed, and began with us each outlining why we wanted to attend, and then we discussed a range of questions posed by the organiser such as; Where do you see the structures of sexism? What is my role in the problem? How we teach circus…. should it should change? By creating a space are we creating a divide… are we simply creating another category? Am I surrounding myself with people who look like me? Who chooses the stories we see onstage and why do we struggle to have equal numbers and equality onstage? The discussion group was an interesting spread of a range of nationalities and cultures, not very broad, but considering the context and event, it could have been less diverse – Nordic countries are still primarily white, thankfully in recent years this has begun to change across the board, including in the arts. Perhaps it was due to the brevity, or the lack of men, yet the discussion never really developed to touch on the actual aim–which was to propose clear ideas on how men can respond in the circus world (and outside) to change and evolve in the post #metoo environment, towards equality, nullifying patriarchy and toxic masculinity. This is no small task of course, and unfortunately involves dismantling thousands of years of habits and rules. Although it was frustrating, I was also relieved that we didn’t lay down concrete ideas for the way forward, after all, that would be precisely what a room of mainly men would have done for a women’s meeting in the past. Times are moving forward, it’s not for any gender, race, religion or person to tell another what to do. It’s up to them. There is always help in the problem-solving, and sharing an understanding of each other, but no more rule-making and patriarchal/colonial control (I draw distinct parallels). This is new times. At least, that’s what I’m believing. I went to see Circus Xanti and Ali Williams’ As a Tiger in the Jungle. This piece tells the story of children sold into slavery in the Indian Circus with the ‘tiger’ in the jungle as the slaver hunting the children. 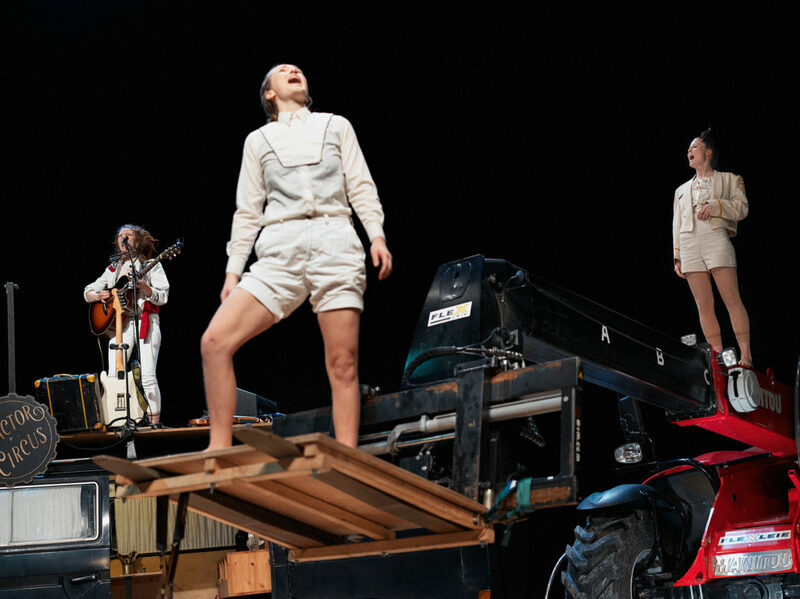 This partly autobiographical story is a needed and powerful counterpoint to the (mainly Western) romantic idea of ‘running away with the circus’… The audience enters, already the stage is open and set, with a tripod structure, one side a ladder, and from the centre point a globular cage hangs, wherein a performer sits watching the audience as we enter. Marianna Ferreira (the performer in the cage) becomes our main narrator, presenting the story of the twins, their Mother who sacrificed herself to the ‘tiger’ (human traffickers), and the children who become slaves in the circus. This heartbreaking story of the reality behind the circus we watch onstage, as they wear their costumes, tell their story, it’s a breath of fresh air in the overwhelmingly white European/first world culture/attendance of Subcase. Contrary to the minimal, clean lines of the Scandinavian circus style, this production had opulent use of colour, costume, story and music. I was enchanted and moved by the artists and the story. 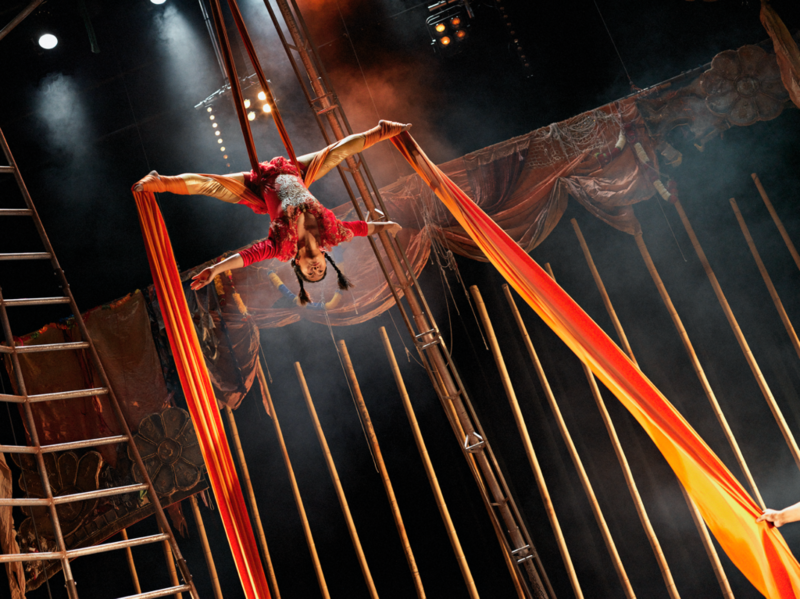 The verbal storytelling, music, and circus aerial acrobatics on silks and Lyra, both solo and duo acts, at times counterweighted, were interwoven beautifully in the telling. The circus presented with the ease of those doing it since childhood, art and beauty from a tragic beginning. I was transported to another climate. The feminist punk show Hairy Tales by M.P.A.C. 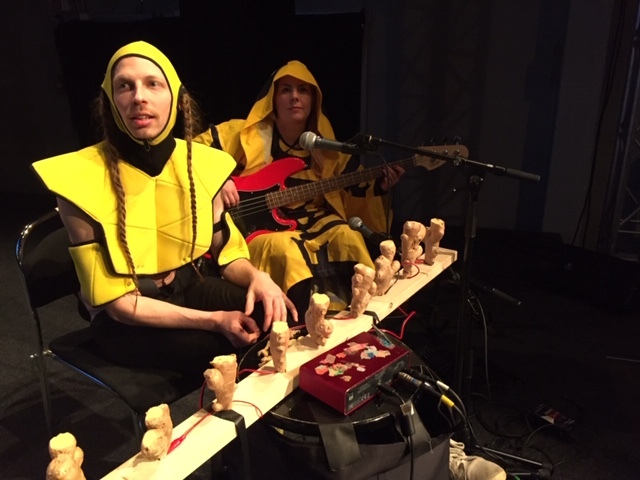 was also shown, created and performed by Jenny Soddu, Karin Svensson, Kajsa Englund, and Camilla Rud. If you have problems with female body hair then maybe this is not the show for you, or indeed maybe it’s the perfect show for you. Ever wondered what happens to all the hair caught in the plughole? Can hair-hanging happen from something other than the hair on your head? A tongue-in-cheek, and very much at times out-of-cheek look at socially acceptable female hair growth/removal/dying, Hairy Tales has much of the audience rolling laughing in their seats. Mainly presented through clown, there is pair acrobatics and some surprising new hair-specific disciplines that I won’t spoil for you. Dearest Subcase, so much new work is being made and presented. I heard much talk of the work-in-progress showing of Plast by Hyphae, and the full-length show Gregarious by Company Soon. As well as Henrik & Louise’s Two, Tractor Circus by the Tractor Circus Project and Jaypeezee’s Mixrace Mixtape, Racehorse Company’s URBOTEK. The list goes on (and can be foundhere). It was certainly a positive blast to experience the social side in the evening mingles and at the marketplace/exhibition space where 42 companies had tables for a few hours on Thursday and Friday, and programmers/ festival producers wandered, sharing thoughts and buying, selling. I guess everything is for sale. It was my worst nightmare of course as an artist–but still a joy to see my friends from Sisus Cirkus, Svalbard, Circus I Love You, Hyphae, Cirkus Cirkör, etc. in the same boat and to note how they promoted their various works. The evening mingles were pretty legendary, very fancy (by my standards at least), wicked music skills from the incomparable DJ Niki Niklas Blomberg, more than your usual DJ on the buttons, much dancing and fun was had. My regrets? That I had to Cinderella most of the mingles due to work and flights to other countries. My memories? All the beautiful faces, warm smiles and friends missed and seen again. Now we’re back to circling the world in our usual ships inthe night. Subcase, you are definitely a melting pot meeting place of warmth, which is not always the case in a showcase/marketplace for anything. All photos courtesy of Subtopia. Photo credit Alex Hinchcliffe.